Welcome to your Tongan Escape Block of the Month! Now’s the time to make your escape from the everyday! 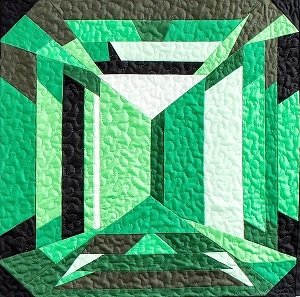 Sign on to this incredible quilting project and you’ll feel like you’re on a seven-month tropical vacation. Each month brings beauty from the islands to brighten up your entire month! Designed by Cozy Quilt Designs, this 7-month Block of the Month project contains directions and Tonga Batiks Nutmeg fabrics by Daniela Stout for Timeless Treasures. 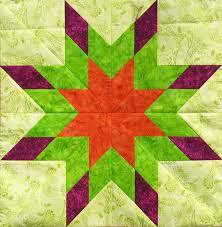 Sharyn Craig has designed the stunning Tongan Escape quilt with lovely 9″ blocks. It might look complicated, but the finishing elements are really very simple. Each pattern offers the instructions for a 9″ block that will be made twice, each with a different arrangement of your fabrics. Our Tongan Escape blocks can be made easily with your rotary cutter and the help of our Phase 1 Building Blocks Templates! If you prefer to make your own templates, our pattern is written with instructions for that, too. 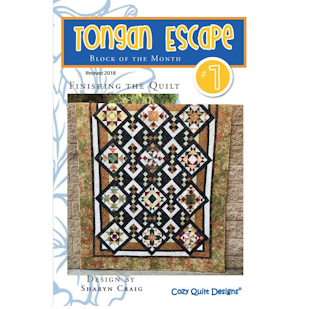 Tongan Escape quilt finishes at approximately 63″ x 80″. When your are piecing your finishing option, you may like Sharyn’s Cutting Corners Ruler™. It’s a terrific tool to use with the pattern! Two class options per day: 12 pm to 3 pm (Afternoon) or 6pm – 9 pm (Evening). Unlimited available	 Tongan Escape - All Patterns $70.00 Patterns for all months are included. Unlimited available	 Tongan Escape - Kit $315.00 Kit includes materials for all months.